You’ve tried every which way to sell a wrecked car. The sign on the windshield, parked at the end of the driveway yielded no results – not even tire kickers. When you tried to trade in your crashed car, you were laughed out of the dealership. The online ad you placed got lots of clicks but did nothing more than get a few lowball offers and no one actually interested who buys crashed cars. It begs the question: can you sell a wrecked car with no hassle? It there a glimmer of hope to sell my crashed car? There are Ways to Sell Crashed Car Easily! Don’t be too discouraged. It might have been a struggle up to this point to find people who buy wrecked cars. Like anything, there are ways to sell a car that feel like beating your head against a wall, and other methods that are effective and easy. You need to know your demographic – your sales audience. If you’re trying to sell a car that’s ready to drive away, it’s easy to find a buyer when you advertise online. Craigslist, Autotrader, and your local Facebook Marketplace are full of cars that run and drive, and people buy them all day long! But to sell a crashed car, this isn’t the right venue. These shoppers are buying in the moment, probably because they need something they can drive right away, not a project like yours. You can park your car on the side of the busiest highway with a ‘For Sale’ sign on the window. Thousands of people are going to see it while they’re driving. Surely one of them wants to buy your junk car, right? Again, it’s all about your audience. If your car stands out negatively – like maybe it’s been crashed – odds are that people are going to drive on by without a second look. You could leave your car parked out there for weeks without so much as a text message to show for it. A dealership has no interest in taking your crashed car on trade. 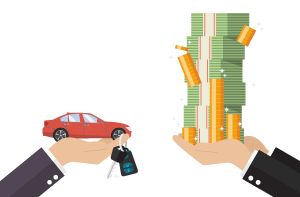 They’re in the business of flipping vehicle trade-ins quickly to make as much money as they can. Unless you’re practically giving away your car for free, you won’t have much success at the dealership. One way to sell a wrecked car without all the hassle is to sell it online. It’s very different than putting a classified ad out that hopefully attracts people who buy wrecked cars. Instead, you’re requesting a direct offer from people or a company who buys crashed cars. But be careful trying to sell your car online. You might be offered one amount, then the buyer tries to renegotiate when they’re picking up your car. Plus, you’ll need to arrange to get it to the buyer somehow, and that can be expensive too. scrap value for your crashed car and you walk away with coffee money for the week in your pocket. But whatever you gained by selling it to the junkyard could be all for nothing. It costs more than you’d expect to tow a car these days, and it could totally wipe out any profit you’d make. What’s the Best Way to Sell My Crashed Car? There’s a better solution yet. Imagine you could have the ease of selling your car from your comfy armchair in just 90 seconds. And picture your car disappearing over the horizon without having to lift a finger. That’s how easy it is to sell your crashed car to DamagedCars. Simply stated, we pay cash for wrecked cars. All it takes is a few minutes to fill out your vehicle information, right here on the DamagedCars website, to request a no-obligation offer for your crashed car. When you submit your information, it takes about 90 seconds to find out how much you can get for it. Then, if you accept the offer for your vehicle in as-is condition, we’ll get you paid fast. You’ll have money in your hand, usually within 24 to 48 hours. Once you’ve been paid, DamagedCars will arrange to pick up your car from wherever it is, and at no charge to you. It’s as easy as can be to get cash for wrecked cars – totally hassle-free. Why wouldn’t you give it a shot? Request your guaranteed, no-obligation offer for your crashed car today.